Delhi is the national capital city of India. It’s a symbol of the country’s rich past and thriving present. It’s a cosmopolitan city, with an ancient blend. History is in the air of the city. The existence of the city is as old as epic Mahabharata, where the town was known as Indraprastha. Over the centuries, eight more cities came alive adjacent to Indraprastha: Lal Kot, Siri, Dinpanah, Quila Rai Pithora, Ferozabad, Jahanpanah, Tughlakabad and Shahjahanabad. Delhi has been capital of few prominent dynasties, the Tughlaqs, the Khiljis and the Mughals. Delhi is home to architectural wonders created by emperors in the past. 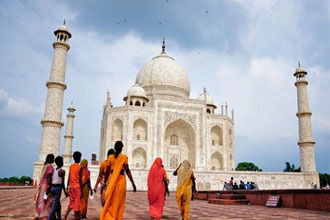 Delhi is an introduction to the incredible India. So, we welcome you to come and experience the city where the modern meets the ancient. The highest brick tower in the world and a UNESCO’s world heritage site. The Lotus Temple, located in Delhi, India, is a Bahá'í House of Worship completed in 1986. It is one of the largest mosque in India constructed in 1656 AD. It’s a Memorial to Mathma Gandhi. Rickshaw Ride at Old Bazar. Photo Stop at Red Fort, Parliament Street, President House and India Gate. Enjoy shopping At Chandni Chowk. Buy Some Souvenirs For Your Friends And Family. . In the Evening you will be dropped at your hotel with the cherishing memories of Delhi sightseeing tour.